Home featured I’m not a settler. Well, I’m not anymore. I used to be a settler. I’m not a settler. Well, I’m not anymore. I used to be a settler. You’ve seen the Direct TV commercial in which a modern family has “settled” for basic cable instead of upgrading to the supreme services of Direct TV. The first time I saw it I flashed back to my third year of teaching in 2002 and thought of how I was a “settler” in the field of education. I had settled into a comfortable routine in my classroom. I was comfortable doing the same thing for each unit. The routine was simple. Notes, worksheets, review, then test. Repeat. It felt good. I was a settler. I had settled into doing what made me comfortable in my classroom. Luckily, I changed my way of thinking in regards to pedagogy and tried to make the learning experience in my classroom an event instead of a class. I had to do it. I realized I wasn’t doing what was best for my students, I was doing what was best for me. We all have “settlers” in the buildings that we teach in. No, I’m not saying that the settlers are bad teachers. They’re just comfortable. Too comfortable. 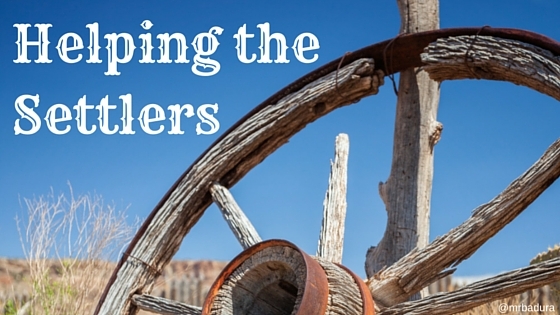 How do we transform those settlers into "pioneer" teachers? Pioneer teachers being the ones that are on the bleeding edge when it comes to making sure each and every student is engaged in their classrooms? The pioneer teachers are using various forms of educational technology, creative engagement strategies and are always looking for a way to make learning sticky in their classrooms. So how do we help our settlers? Below are some strategies that I have used in my role as an Integration Specialist to try and help some of the teachers that I work with in and out of my building. Some settler teachers don't even know that their style of teaching isn't working. Once you are stuck in that rut, it's hard to get out! You need to let them know, and that’s a hard thing to do! Yes, the conversation of maybe changing things up a big should come from your building Principal, but they may have a better relationship with you so the discussion of needing to change things up a bit coming from you will be more meaningful. Get in their classroom. Give them feedback and LOTS of suggestions and ideas on how to change or improve their lessons. Get you settlers in your classroom or the classrooms of your pioneer teachers. Let them develop a trust in what you are sharing with them is effective in the classroom. Share what works for you, don't be an idea hoarder! Show your settlers how to harness the power of social media to transform the teaching and learning in their classrooms. Let's face it, isolation is a choice that we now make as teachers. Choosing not to use social media for educational purposes when the students sitting in our classrooms are all connected is no longer acceptable. Connected teachers that utilize Twitter, Pinterest, Instagram, Facebook, etc., have a plethora of ideas and other teachers that are willing to help at any given time. Helping your settler develop and create a robust professional learning network will pay huge dividends. I'm sure you have an idea or two that has worked with settler teachers you have encountered. I'd love for you to share in the comments below. Until then, get out and continue to blaze that trail of being the awesome teacher that you are! Great post Craig! I think your last point is super important. I know for me personally, being connected has given me the courage to try new things I never would have even thought of without my PLN! In this book I'm reading, called The Innovator's Mindset, George Couros says "isolation is the enemy of innovation!" On the flip side, the key to upgrading to pioneer living is seeing what is out there in the wide world of education by being connected!